The OpTac International SWAT and Critical Incident Management Program, hosted by the Washtenaw Metro SWAT Team, will be held April 26-27, 2018 in Ann Arbor, Michigan. An effective law enforcement response to critical incidents involving armed suspects can determine whether someone lives or dies. The OpTac International SWAT and Critical Incident Management Program is based on the book, SWAT Operations and Critical Incidents: Why People Die, written by Stuart A. Meyers, and includes his prize-winning Harvard University research on the complexities of critical incident management. Law enforcement administrators, executive officers, incident and tactical commanders, and SWAT team personnel will benefit from an improved understanding of critical incident management, and its associated legal and liability concerns from both organizational and operational perspectives. 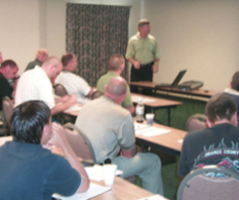 Presentations include an analysis of contextual and hierarchy leadership, contemporary command decision-making, practical applications for incident management, and a model of essential organizational conditions to increase the consistent likelihood of successful incident outcomes. The cost to attend this special event is $425 per person. There is limited space available, therefore, paid reservations are accepted on a priority basis.